More than 50 students in the tiny town of Briceville have received college scholarships from the Coal Creek Watershed Foundation since 2000. The catch? Scholars simply have to tell elementary students they can do it, too. You may hear the name "Coal Creek Watershed Foundation" and wonder what in the world the non-profit group has to do with helping students in Briceville become doctors, therapists, or graphic designers. The simple answer is Barry Thacker and Carol Moore. The duo from Schnabel Engineering worked on a project to improve water quality in the area decades ago, but soon poured their hearts into the community itself. 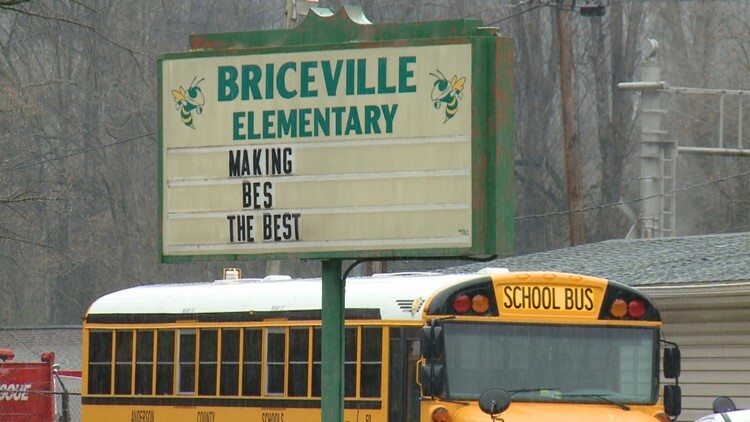 "We fell in love with the kids here at Briceville School. We would be out here, and kids would come up and give you a hug. Briceville had a not-so-great reputation and it just did not compute with what we were seeing," said Thacker. Sign at Briceville Elementary School in Anderson County. In 2000, Thacker and Moore decided to create a scholarship program to help students from Briceville go to college. The idea was met by skepticism from some county leaders. "When we started this scholarship program, the sheriff at the time told me that you are wasting your time. He said these kids have a better chance of going to prison than to college. That was probably the one thing that motivated me more than anything else," said Thacker. "These are great kids with lots of potential." Since the start of the program, the Coal Creek Watershed Foundation has awarded $520,000 worth of college scholarships to students who attended Briceville Elementary School. The students who accept the $10,000 scholarship are merely required to return to the elementary school and tell the children they can do it, too. A Coal Creek Scholar speaks to 5th graders at Briceville Elementary School about attending college. 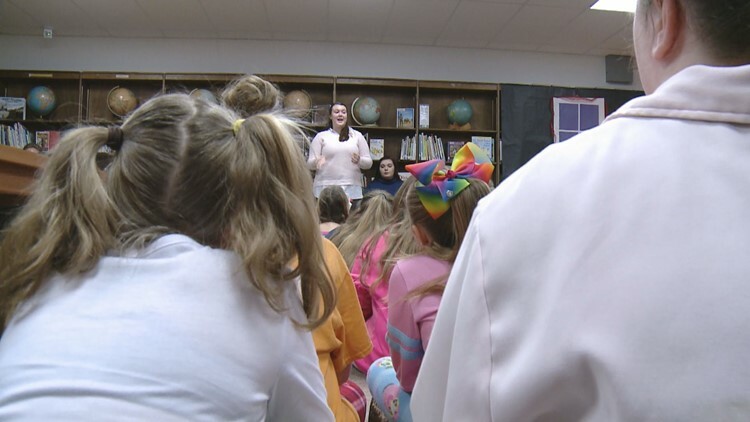 Thursday morning, around 10 college graduates and current college students who received the scholarship spoke to a crowd of children in the library at Briceville Elementary School. The speakers included Amy Crabtree, the very first Coal Creek Scholar. Crabtree attended Lincoln Memorial University, earned her master's, and is now a licensed therapist. "This program means everything to me," said Crabtree. "It gets emotional every year to come back here. I sat in these desks and these chairs right where these kids are today. I have been doing this long enough that some of the students in the first class I spoke to are now in college with the scholarship and said my words way back then affected them. It's powerful to know you can have that kind of an impact." "This program starts with these children in the 4th and 5th grade and follows them all through high school. 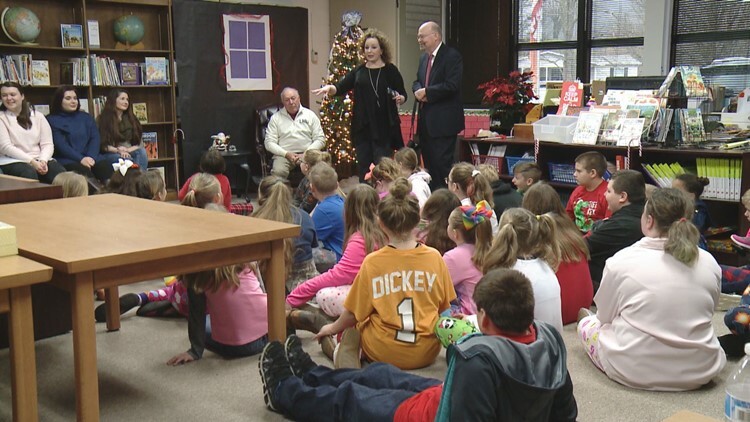 You can't help but be inspired," said retired Briceville Elementary School principal Tom Braden. "Carol and Barry may have had a bigger impact on this school than anyone who has walked through those doors." Carol Moore and Barry Thacker of the Coal Creek Watershed Foundation attend the group's Scholar Day at Briceville Elementary School. "Today, we asked these kids how many of you want to go to college and every kid in the class raised their hand. When we started 18 years ago, we would usually get one or two. They see these students come back and say, 'If they can do it, I can, too.' They are role models." Thacker credits the students who put in the work for the success of the program. He calls it a blessing to see students overcome everything from financial barriers to the cynicism of former sheriffs. Carol Moore and Barry Thacker with the Coal Creek Watershed Foundation speak to students Briceville Elementary School about the group's scholarship program. "By gosh, we have proved him [the former sheriff] wrong. And it has blessed my life to see a dream come true. That's what these kids have been is a dream come true," said Thacker. Thacker said he and Moore have primarily funded the scholarships with their own money. However, the non-profit Coal Creek Watershed Foundation is able to receive tax-deductible charitable donations for those interested in contributing to the cause. The foundation also helps with historical preservation and education in the region.